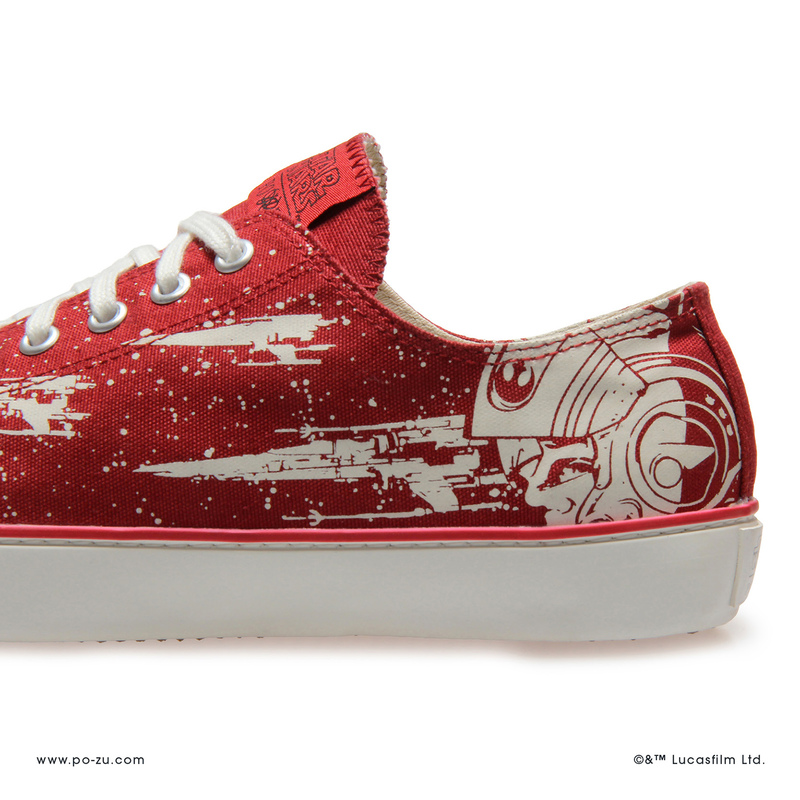 Po-Zu has the announced the latest addition to their Star Wars line of shoes. 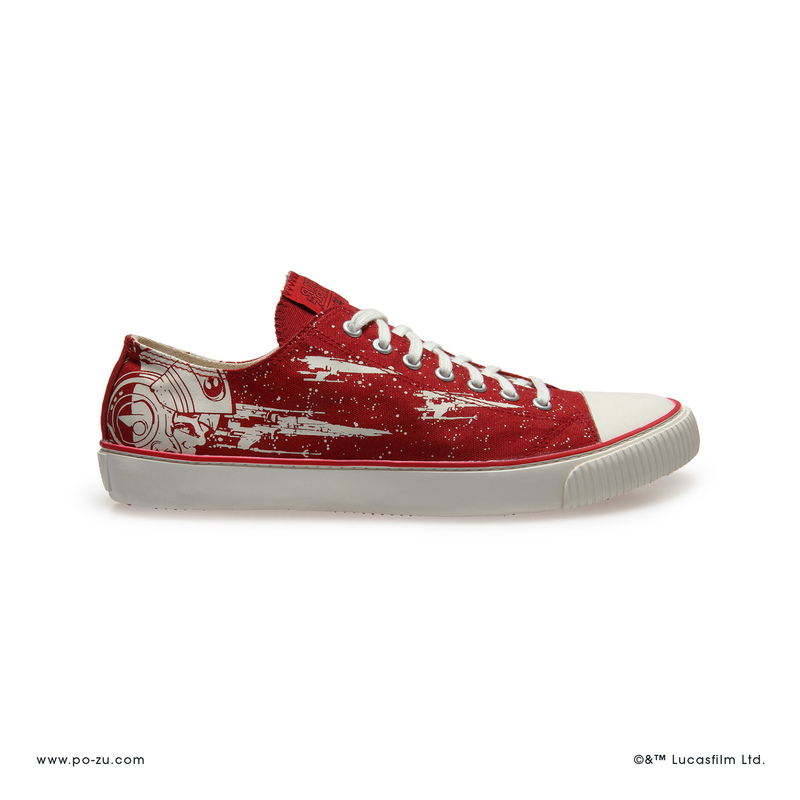 The X-wing themed shoes will feature Poe Dameron and three X-wings on a red canvas. These shoes will retail for 59 lbs and will be available in men’s and women’s sizes. Star Wars fans attending Star Wars Celebration Chicago will have the chance to try on and purchase these shoes at booth 5315. 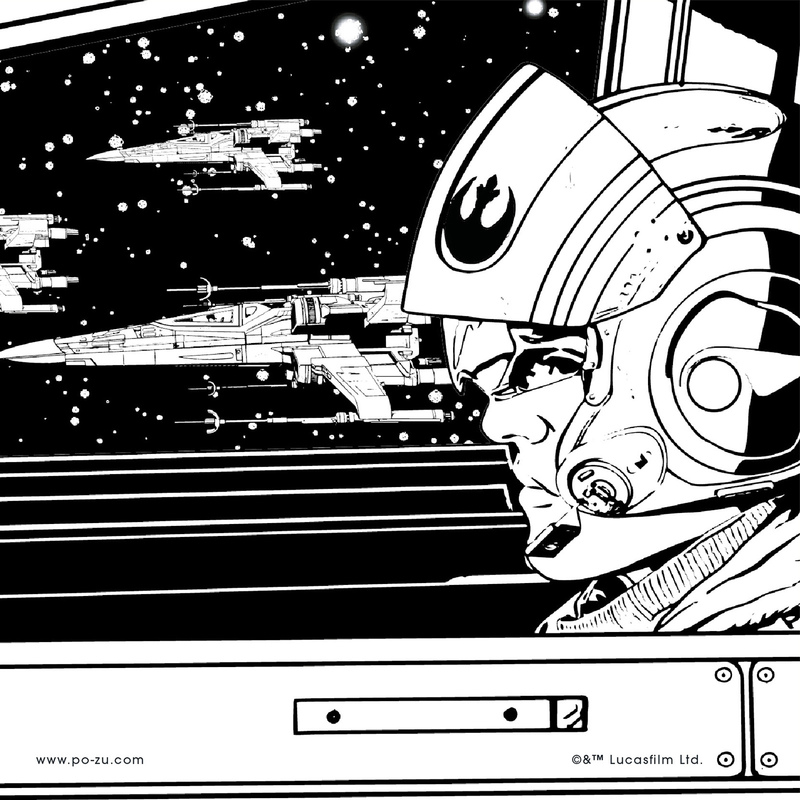 There is nothing more central to the Star Wars story than the brash and brazen X-wing pilots, whose skills and one-in-a-million shots make up the very essence of everything Star Wars. Now Star Wars fans have the chance to RESIST and stride out in style. The latest shoe to be released by ethical shoe brand Po-Zu, shows vivid schematic detail of X-wing fighters in action surrounding a striking helmet design. 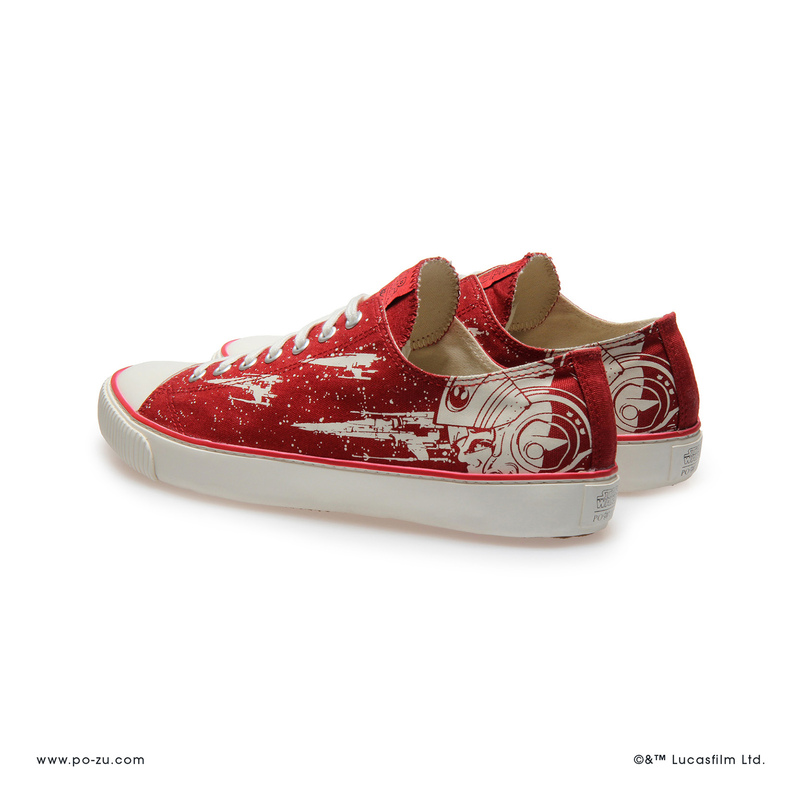 The X-wing joins an extensive co-branded Star Wars | Po-Zu sneaker range which include the astromech inspired R2-D2 design, high tops and low cuts emblazoned with Porgs, and a subtle yet striking Han Solo sneaker inspired by the Corellian Bloodstripe. Po-Zu is the first brand to publish designs worn by the main characters in the films like Rey, Poe, and Finn, whilst building sustainable materials and ethical manufacturing into the mix. Working with natural tree-tapped fair trade rubber for their soles, a coconut fibre foot mattress and organic cotton uppers, this shoe has impressive sustainability credentials and comfort features built into one. The shoe supports local communities, uses much less water and pesticide treatment than conventional cotton and is made with materials available close to the workshops ̶ the coconut husk is found locally in Sri Lanka and the natural rubber is tapped from tree plantations two hours away from assembly. The trademarked Foot-Mattress™ technology made from natural rubber and coconut fibre is designed to softer the impact when your feet hit the ground. 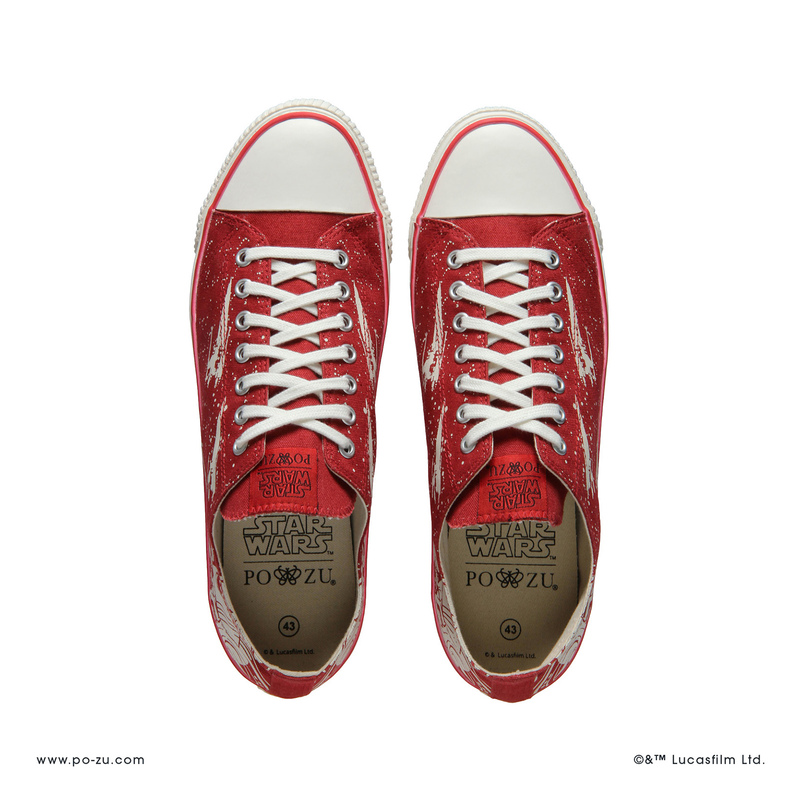 In April 2019, Star Wars Celebration attendees will have the opportunity to try-on and buy the X-wing Pilot sneakers at the 13th Star Wars Celebration in Chicago where Po-Zu will be exhibiting at stand #5315.
International fans can purchase the product online for £59 with speedy international shipping available.